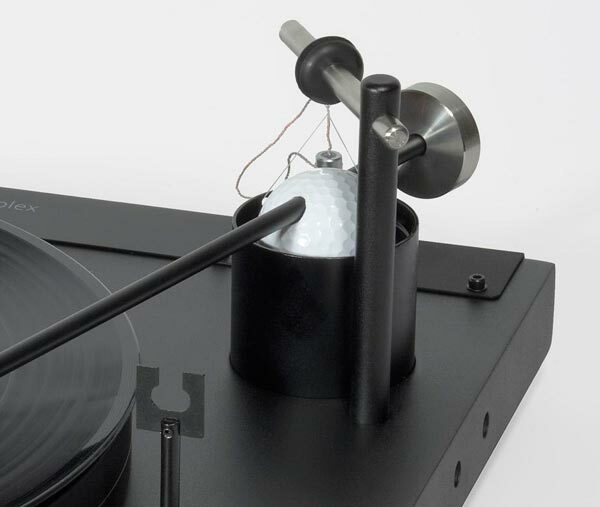 A turntable fitted with sliced squash balls, sand squeezed through an aluminium tube, and a golf ball for good measure? It sounds like madness, but the new Simplex, reckons Ashley Kramer, is product of the year so far. When you strip away anything that’s not essential and then simplify the remaining fundamentals using good science and lateral thinking, the results can be phenomenal. Take something like Colin Chapman’s original Lotus Seven or the more modern Ariel Atom super car; bereft of just about everything bar engine, chassis and drive train, their stunning performance is an excellent example of minimalism in action. Another example is this Well Tempered Lab turntable. It doesn’t have a platter bearing machined to ultra-tight tolerances or a fancy tonearm made of exotic materials. Hell, it doesn’t even have tonearm bearings. The Simplex has been simplified within an inch of its life, leaving behind a high performance skeleton designed to do nothing more than extract information from records. Designer William Firebaugh has been creating and tweaking his eccentric turntables since 1985. The Amadeus was his recent shot across the bows of mainstream turntable design, and the Simplex is the latest evolution – an Amadeus pared back even further. There’s not much to the Simplex; a thick MDF plinth is supported by sliced squash balls at each corner. A small servo controlled motor drives the chunky platter using a thin polyester filament (0.004” if you must know). The tonearm is made up of a length of aluminium tube filled with sand and jammed through a golf ball. Yep, you read that right, a golf ball, which is suspended from a small tower and dunked into a tub of silicon goop. Even the “zero-clearance” teflon platter bearing is as simple as pie and the cartridge is mounted in a rudimentary headshell which allows no adjustment of the cartridge geometry. Heresy! Sounds like something your slightly mad Uncle Wally might whip up in his West Auckland shed alongside his anvil powered mousetrap and solar powered combine harvester? Could well be, but there’s method to the apparent madness. The Simplex tonearm is based on a 1977 study by The Bruel and Kjær Company of Denmark, “The Audible Effects of Mechanical Resonances in Turntables”, which dealt with a deck’s mechanical stability. 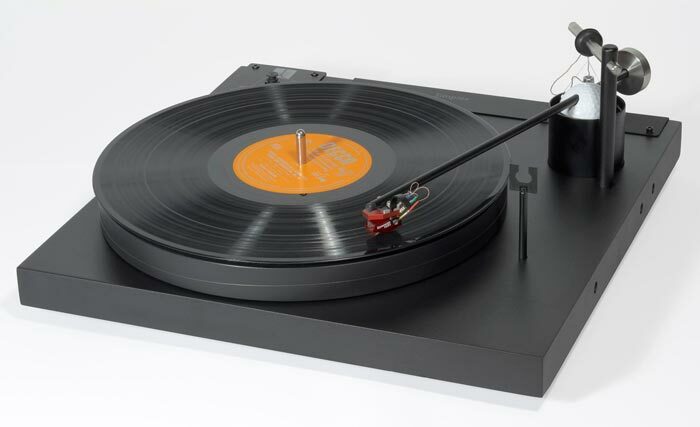 The study indicated that a turntable’s tonearm should have a low effective mass and be highly damped to eliminate side-band distortion caused by mechanical instability. Side band distortion = bad, okay? Hence the zero-clearance tonearm, which uses no bearings at all. The rest of the Simplex’s structure is intended to do nothing more than provide a stable platform and a rotationally stable platter. It took around 50 prototypes for Firebaugh to end up with the Amadeus, and its performance very definitely speaks for itself, as does that of the Simplex. The looks are pretty basic; far removed from the bling and glitz associated with many modern turntables, which are design statements as much as hi-fi products. The build quality is prosaic, but the Simplex still looks good to these eyes, and the minimalism is appealing. Setup isn’t close to being plug and play – the review sample was set up for me; all I had to do was mount the cartridge. A look at the owner’s manual shows that getting up and running is very much a hands on process. It’s not exceptionally complicated and anyone with a modicum of mechanical ability with an Allan key and the ability to follow instructions will be fine. The motor is powered by a little wall-wart power supply (another heresy, imagine that), while the tonearm cable isn’t continuous – there are two RCA sockets and a ground connector on the back panel, so you can use your cables of choice. It even ships with a digital stylus pressure gauge. Isolation from external vibration is quite effective considering the simplicity of the squash ball suspension system, but you’ll need to provide a level surface as there’s no self-leveling built into the plinth. I mounted a Dynavector DV-20XL low output moving coil cartridge into the arm and used a Dynavector P-75MkII phono stage in phono-enhancer mode plugged into my Yamaha/Sachem/Theophany system. NB – the price of the Simplex has been reduced from $2,999 to $2,750. This information reached me a day or so after the review was loaded, so I have adjusted the price on the review. This price reduction makes the Simplex an even better buy and pretty much the default choice in the $3,000 turntable sector but five stars is five stars….can’t rate it any higher than that. Five and a half stars Ash? If such a thing existed, the Simplex would probably qualify. It’s been pointed out to me that the squash balls under the Simplex aren’t sliced in half at all. The complete ball is recessed into the plinth. I was wondering how they managed to cut the balls so cleanly in half, having tried it myself with minimal luck. So, how does it sound compared to the Amadeus? I think that is the main question most people want answered. That’s the question I’m asking as I decide whether to buy a Simplex or an Amadeus. I haven’t heard an Amadeus for a while and when I did, it was running a DV2XX cartridge as part of a Consonance/Monitor Audio system and it just about blew my socks off. Without comparing them side by side, it’s hard to say which is the better TT. I’m reliably told that the sonic differences, if any are extremely minor and that Bill Firebaugh prefers the sound of the Simplex. I prefer the look of the Amadeus but I’m not sure if that’s enough to make me buy one instead of a Simplex. The difference in cost can be put towards a cartridge upgrade and I have no doubt that the Simplex can do justice to a DV2XX, so that’s where I’m leaning at the moment. Does anyone have dimensions for the Simplex? Thanks for the review, but will it ever make it to the USA! Hopefully so because this table seem like a winner. I did contact them and it sounds like it should be available in the spring or early summer. Will be curious to see what you find out. Any update on the Simplex or whatever Well Tempered you settled on? How’s it working out? Alas my Simplex is in storage along with all the rest of my hi-fi system while I’m on my travels. I’m in the process of writing up a follow up on the items that I’ve bought over the years but all in all, I’m happy with the Simplex. It’s a sonic star. Hi, this and other reviews show a good report – my only qualifier is that Soundline supply the product and the reviewer is associated with Soundline?? Hi Chris, I’ve lurked around with Ash for a few years and rest assured he has no affiliation with Soundline that I’m aware of. A quick squiz at his gear reveals the only Soundline-ish product he has on his hifi rack is the Simplex, everything else is either esoteric imported stuff (Silverknight passive pre for instance) and a luscious pair of Theophany M5’s! I’ve got zero affiliation with Soundline – I use some Dynavector gear and the Simplex TT because I rate them highly but like all my other audio equipment, they stand or fall on their own merits – I’d chuck them in a hurry if I found something else I preferred. The Simplex stays. Not as yet. I’d like to arrange this sort of side to side comparison though. I changed from a fabulously built Well Tempered Record Player to the Simplex…clearly not as well built but demonstrably better in sound (and ease of set up). Running it with a Dynavector 17D and P.75.Mk 111. Can’t imagine it get much better than this. Also had a very handsome 4mm acrylic dust cover made for £40! I found the Well Tempered Record Player used for $800 US. Since you used to have this turtable, would it be a good deal? Also can you tell me what you liked and didn’t like about the Record Player?